Why is God's prophetic word being ignored in churches today? Dr. Reagan: 2 Peter 1:19 says, "We have the prophetic word made sure," that means we have the prophetic word fulfilled, and it says, "you should pay attention to it because it is like a lamp that is shining in a dark place." Now, here we have a command from one of the apostles of Jesus Christ that we should pay attention to Bible prophecy. I think you would agree with me that there is probably no topic in all of the Bible that is more ignored in teaching and preaching today than Bible prophecy. Why do you think that is? August Rosado: That's correct, and 2 Peter 1:19 is the goal of my ministry. Peter says, "We have also a more sure word of prophecy where unto you do well to take heed." One out of every three passages in the Bible deals with prophecy, and so I feel that it is very important to God and it should be important to us to study God's prophetic Word because it is our blessed hope. That is out of Titus 2:13 where Paul says, "That we ought to be looking for that blessed hope, and the glorious appearing of our Great God and our Savior Jesus Christ." Unfortunately, prophecy is not a popular subject in the Church today. You just read 2 Peter 1:19, "we have also a more sure word of prophecy." So, if it is important to God, it should be important to us. It is also ignored because it is very controversial. There are so many different positions when it comes to prophecy today: Pre-Trib, Mid-Trib, Post-Trib, Pre-Millennial, Post-Millennial, and Amillennial. Let me give you a case in point. I called a pastor in Rhode Island and asked if I could come and preach on prophecy at his church. I wanted to talk about the Rapture. He said to me, "I appreciate what you are doing, Brother Rosado, but in this church we will not teach Bible prophecy because our people will get too confused. I am not familiar with the subject." Even though he told me that he had a Doctorate of Divinity —a Ph.D. — yet he knew nothing of Bible prophecy. He appreciated me going around the country preaching on prophecy, but not there in his church. Dr. Reagan: I think you needed to quote 2 Timothy 3:16, "All Scripture, [all!] is inspired by God and profitable for teaching, for reproof, for correction, for training in righteousness." Are we going to take a quarter to a third of the Bible and put it on the shelf and forget about it? August Rosado: That is what his church is doing. Dr. Reagan: Nathan, what do you think about this point about churches ignoring Bible prophecy? Why do you think they do that? Nathan Jones: I agree with August. I think a lot of them are scared. Pastors are coming out of the seminaries where they are taught how to build churches and how to increase numbers, but they really don't teach anything about Bible prophecy. New pastors then just don't have any foundation on which to teach that topic, so they avoid it altogether. That is why it is great when guys like August and like our ministry can help pastors and churches understand that part of the Bible which they were never trained in. Dr. Reagan: I find most preachers are afraid of Bible prophecy and there are many reasons for that. They are afraid that it will cause controversy, and it can. If you get a Bible prophecy teacher who comes in with a chip on his shoulder and his attitude is, "I am going to tell you what the truth is, and everybody who disagrees with me is wrong," he can start dividing a congregation. Just stick with the Word and talk about the Word. After all, Bible prophecy focuses on Jesus Christ, and so you are going to have people focusing on Jesus. One thing that aggravates me to death is when so many pastors say to me, "I'm not Pre-Millennial, Amillennial, or Post-Millennial. I am just Pan-Millennial in that I think it is all going to pan out in the end." Do you know what that person is really saying? He's saying, "I have not spent anytime studying it and I'm not going to." August Rosado: That is unfortunate in our churches today. We just don't want to study God's prophetic Word. You know, there is a blessing to studying in Bible prophecy, and that is out of Revelation 1:3. Dr. Reagan: Tell us about that blessing. Why is it so important to study Bible prophecy? 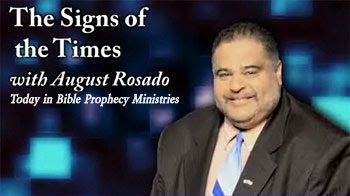 August Rosado: Because, there is a blessing involved in Revelation 1:3, "Blessed is he that readeth, and they that hear the words of this prophecy, and keep those things that are written therein: for the time is at hand." Dr. Reagan: The Bible is the only book that specifically promises you a blessing if you'll read it. August Rosado: That promise is right there in the Book of Revelation. We are robbing ourselves of a blessing from studying God's prophetic Word. If John said 2,000 years that the time is at hand, and now it's 2,000 years later, how close can it be? He has to be coming soon, and very soon. So, there is a blessing for those who study prophecy, and we ought to be studying prophecy. Nathan Jones: It's all about Jesus' victory and through Jesus it is our victory, too, and that is something to get excited about. August Rosado: When we read the end of the book, we then know who wins. Dr. Reagan: Plus, we get the promise of hope. We go to church week after week carrying all the stresses of life and then nobody tells you about the hope that you have about Jesus' coming. He's going to straighten this world out. There is going to be peace, righteousness, and justice flooding the earth as the waters cover the sea. I mean, that's hope! August Rosado: That is right out of Isaiah 11:9, "The earth shall be filled with the knowledge of the Lord, as the waters cover the sea." I would have to say that pastors are just as guilty of robbing their people of the blessed hope by failing to teach and preach Bible prophecy. Just last year I preached in Mississippi and the pastor approached me and he said, "Brother Rosado, despite all of my education, you opened my eyes to the prophetic truth of God's Word. I knew nothing of what you said despite my seminary training." Now, that's encouraging! In the next part of our interview with August Rosado, we'll ask him what's the key to understanding Bible prophecy. Important article! Let me give my twopence worth. I would say that probably the main reason pastors do not preach prophecy is because they are following the ecumenical train. If they taught from the Book of Revelation (for example) they would have to expose the Vatican System as a false Babylonic religion and therefore go against the Vatican II ecumenical mandate of restoring all branches of Christiandom back to Rome. I believe those who refuse to teach prophecy are probably linked to Rome and/or New Age on one or another level. You will notice I discuss/prove the corruptions of ecumenism in great detail on my blog. I am searching the scriptures to decide if the Rapture will be pre or post... I know there will be a rapture, but not sure yet when.. please explain this verses.... It is John 6,39,40,44,and 54.. All end with ( Raise up in the last day.). I have read all the prophecy books in bible and even go to sites that tell of the rapture.. I can see the prophecy happening now.. but just can't decide whether it will be pre or post.. I am leaning to pre.. but those verses in John.. made me take a second look........... It might be just the devil trying to mess with my mind... either way.. I know God will see me through it..
Anony, when is the last day? Is it at Rev 20:4 which is post second coming? Do the two witnesses need to have their last day resurrection again just so there is one technical last day? Which day is the last day for Millennial people? The rapture timing issue is more complex than “last day” texts. John, I appreciate what you’re saying but I’m inclined to lay a lot of the blame at good ole replacement theology and rubbery hermeneutics. You only have to look at the likes of Sizer, Chapman, Tom Wright and co who do their darndest to ridicule anything prophetic, especially involving Israel. Note that the replacementists are also ecumenical. They are Kingdom Now and Dominionists. It is the Catholic Church which first introduced Dominionist doctrine. Can you see how it is all linked. So I agree that replacementists do not like prophecy. Of course not - they are also ecumenists. Sad but true. I went to one church for years, but when I realized the last pastor that was brought in would not preach or teach it I was very saddened by that. He taught Revelation in the light of how to worship, not anything about prophecy. He said that he didn't believe it was the last days as the whole world had to hear the Word and we were a long ways from achieving that. I finally left that church and am not attending a church where the full word of God is preached. I enjoy our studies in Daniel and other Old Testament books, as well as the New Testament. Thankful to hear this preached! I can see that that is often the case esp. in the UK. However, many of our "Reformed" brothers and sisters in the US are far from ecumenical and very vocal against Catholicism. Most are amillennial and take an allegorical approach to OT prophecy and Revelation. They see "prophecy" as threatening their status as the "new" Israel. But it is ultimately true that RT had it's foundations in Augustine. Its good to hear that there are some in the US who are not joining with Rome and/or New Age. However, I believe that even the reformed brethren have been infected with Rome without even knowing it. For example, many Christians (even unecumenical ones or even enlightened ones are still practicing things handed down by Rome (or Babylon) such as Easter, Christmas, Mothers Day and its various trimmings. Many of these believers do not even question the origins behind all of this or think it is significant enough to reject but still "christianise" these things. Therefore, maybe Replacement Theology is also something they never queried as being something of Catholicism (Babylon) and therefore decided not to reject it. Grand to see your input here; especially as your 'Last Days Watchman' blog is on the links here - AND a fellow Brit – at last. P.S. Saw your message last night, just home from S.Wales. The Church is not appointed to wrath and THE Tribulation is not called ‘The Day of Jacob’s Trouble’ for no reason. It is the final ‘seven’ of the 70 Weeks prophecied in Daniel 9 for Israel, to being her back to God; also to put a final end of Gentile rule of the earth. The Church is the Body of Christ and His Bride, we are all ‘Citizens of Heaven’ seated IN Christ already in ‘heavenly places’ and consist of the ‘dead in Christ’ as much as the living are, and not the ‘earth-dwellers’ upon whom the wrath is coming. When considering the Post-trib (Postie) just remember that the Church and the Rapture were ‘Mysteries’ not revealed in the O.T. until the teaching was given to Paul. The Disciples knew nothing at all about the ‘One New Man’ of Jew and Gentile; in Acts 1, they were still expecting the earthly Messianic Kingdom up until Christ’s Ascension. Yet Posties claim Matt.24:30,31 as the Rapture of the Church. Yet those verses are clearly predicted within the O.T. and are not a ‘mystery’ at all; they concern the re-gathering of Israel scattered around the earth to the promised land of Israel on earth. Most obvious, the living are not ‘glorified’, instead they will physically repopulate the Land of Israel and be ruled by the resurrected O.T. Saints with the Messiah, the Son of David their rightful eternal King for 1000 years – then comes Eternity. There is much more to all of this especially Rev3:10 etc. I have sent you some private emails (to your email address)over the last few days. Just letting you know. I am looking forward to your replies. Anonymous, here is what I believe are 11 reasons why Jesus will come back before the Tribulation. John, good to have your comments! Sue speaks very highly of you. Sue said: "Please would you kindly distinguish yourself from all the other Anonymouses such as initials like ‘rg’. They don’t have to be real!" Real Gent, is more like it! Your article “Eleven Reasons Why Jesus Will Come Back Before the Tribulation” is excellent; very well reasoned from Scripture. I am the anon who asked about John and the verses stating the Last Day... I am a person who knows the Bible is Gospel..no new age stuff for Me.. Jesus is the son of "God who died on the cross for my sins and rose again.. when I read anything if isn't exactly what the Bible says.. then it is wrong... Just wanted you all to know.. that any new religion can't change me from my belief.........Oh one question I have wanted to ask.. in the pre rapture... Will the Christian Jews be taken too... I worry about them so much. in fact I am trying to find a way to prove in the Bible that they might not have to be hurt anymore.. but of course I can't seem to find proof that they won't.. Every since I saw Lamblion on tv.. I have been reading this site almost every day.. I have gone back and read too.. love this site and glad I can ask questions of some one I feel knows the Bible and have studied it. Sorry I was so long winded.. will change my name to JMB..
JMB said "...in the pre rapture... Will the Christian Jews be taken too. YES! The Church is One New Man Baptised into Christ by the Holy Spirit. The Church is both believing Jew and believing Gentile. I am one person that has to think thing though.. like the pre rapture, I just take all the verses and try to study them to make sure I am correct..I do see the end coming.. I firmly believe that soon everyone's questions about the rapture will be answered soon.. Of course I know that no one can predict when but we do see the signs meaning it is very near..I watch all preaching on the Rapture... I love John Hagee and Charles Stanley... I have been trying to find something on Billy Graham and his views.. but have never been able to.. So do any of you know any site or book by Billy Graham that speaks on the Rapture.. I would really appreciate it.. Have a blessed night.. Again thanks for this blog.. Great to have someone to ask questions.. on different subject..
Re. my former post and ‘One New Man’; please read Ephesians 2. Nathan will do his utmost to either answer your question directly, or indirectly. We bloggers will help where we can. I am not aware of any banned topics? Speaking personally - - - I am glad you cannot find anything by Billy Graham! God is His judge, not me, but I keep away from all things Ecumenical. If you don’t know what that word means, you really need to find out – imo! Sue is absolutely correct regarding ecumenism. Billy Graham and his organisation are heavily ecumenical. In fact there are a number of videos etc from Billy where he states his affinity with even other religions like Islam. Please check out my blog which covers ecumenical issues in great depth and why it is wrong. It highlights the trend in Christianity to go ecumenical and which groups are part of that train. You shouls also be careful regarding Charles Stanley who is on the Committee of ecumenical Campus Crusade for Christ and John Hagee who is linked (in some way) with the ecumenical false properity gospel and Word Faith. Rather than look to men (with all their imperfect frailties and vulnerabilities to sin) it is far better to look to Jesus through the Holy Spirit to teach you the Word of God direct. Even if you seek understanding from a trusted teacher, you should still be a Berean ("check the scriptures daily to see if these things are so") anyway. Safest way to protect yourself from deception. By the way, if you choose to read my blog, it would be best to use the blog search facility and type in your key word. I think you will find an answer there for most of your questions. Not everything was written by me, but I have many articles which contain material from trusted experts. Beware of John Hagee. He believes that the Jews do NOT need salvation through Jesus. He is NOT someone to trust. Don't expose yourself to his lies. Billy Graham's organization has taken Bible prophecy very seriously the last few years, and even dedicated their entire organization's efforts for one year to proclaming the soon return of Christ. He gets a lot of flack, but the proof is in the pudding - God's using him mightily to win souls. Hagee's got it wrong about Dual Covenant Theology, but much of the rest of his theology is sound. There'd be no teacher left to learn from if we disregarded them for an odd view or two. But agreed, we have to be Bereans (an overused label in this day). It is a concern of mine too that there is a decreasing number of good teachers (in the 21st Century) who we can trust. I know we don't like that fact, but Jesus did say "a bad tree CANNOT bear good fruit". Anybody who DELIBERATELY joins themselves to Rome in ecumenism or New Age (in some shape or form) is showing themselves to be of that bad tree. A little leaven (or poison) is sufficient to deceive. I say "deliberately" because there are some who may be ecumenical without knowing it (in ignorance). However, if someone is a deliberate ecumenist, then (I believe) it is dangerous to listen to or trust ANY of their teaching. Regarding Billy Graham. How can a true man of God change his message and now teach that "all paths lead to God"? The fact is that Billy Graham took part in the Vatican 11 ecumenical mandate in the 1960's working with the Vatican to bring that resolution into being. I always (like you) believed that Billy was the greatest evangelist and man of God in our day. I found it extremely difficult to accept what I was hearing about him. So I decided to investigate and spent a very long time getting my facts together, listening to his videos since the late 1940's. What I found was very disturbing and showed that he was a puppet for the Vatican culminating in bringing about a wishy washy Christianity in our day. As I said above, we do not need to depend on strong teachers to strengthen our faith or build us up. If we do, our faith will rest on men and not on God.
" These things have I written unto you concerning them that seduce you. But the anointing which ye have received of him abideth in you, and ye need not that any man teach you: but as the same anointing teacheth you of all things, and is truth, and is no lie, and even as it hath taught you, ye shall abide in him." Let's not bash people because of who they associate with (Charles Stanley, Billy Graham, etc.). After all, many bashed Jesus for his associates, too. Instead, of "warning" people away from solid Bible teachers and preachers in Christ, why not just suggest that we ALL review everything EVERYONE says and compare it to God's Word? If this keeps up, I'll not be back! Now, Laura, everyone's entitled to posting their opinion. You've been with us a long time and know we haven't always seen eye-to-eye on every topic (ie sin nature). If John as a pastor in his studies believes that we should be more discerning concerning a particular teacher, then by his tone we can know that he is wanting to help us, not for the purpose of bashing a particular teacher. I've been bashed for supporting the Manhattan Declaration, knowing it's a political rather than ecumenical movement. Considering all the extra-church and political activities Billy Graham has been involved in as a Christian witness over the decades, I do have to disagree with John since that's the context of what he's involved in. Concerning salvation, Graham is dead on doctrinally, even when some take his statements out of context. And, again, look at all the people who have been saved. We certainly do know this man by his spiritual fruit. I've also been to a Crusade and there was nothing alarming doctrinally in the preaching. That there were many churches represented there (Catholocism not being one of them) is a necessity because someone has to take all those new babes in Christ, or they'd get lost. Crusades can't happen without the support of the local churches who put their secondary doctrinal differences aside to win souls for Christ. Isn't that what the true Church should be doing? Amen Nathan! You took the words right out of my mouth! I was biting my tongue trying to decide if I really wanted to get into it. I doubt if there has ever been a single preacher [other than Jesus] who hasn't made a gaff or two and held some odd beliefs that self-appointed "Ministers of Condemnation" haven't labeled as heretical and then condemned their whole ministry! I agree with your assessment of Hagee & there is nothing wrong with Charles Stanley either. John, I'm sorry to say this, but after visiting your site, noticing that you don't have links to a lot of worthy ministries, including this one, and that you condemn a great portion of the Body of Christ, I'm afraid that you are singularly obsessed with the RCC and ecumenism and have pretty much become a "Self-appointed Minister of Condemnation". I see your "visit" here as nothing more than a trolling expedition to recruit new "followers". Sorry if I have mis-judged you. Thanks Nathan for your gracious observation. You are absolutely correct that I was trying to be helpful. One of your regular contributors recommended me of your site and encouraged me to participate about a year ago. However, I couldn't find the right site - only the L & L main site. As that site does not give opportunity for participation, I put it to one side. Only now did I discover this other site (here) which DOES allow contributions. Having read this particular article I felt prompted to say something. I was under the impression (from what I had been told) that you were on the same wavelength as me, so felt confident to write what I have written. Dr No Fog, that is rather unkind of you and indeed you have misjudged my intentions. I checked on ecumenism. and realized that does not include me.. I have never even thought about one church for everyone..All of us are different in some ways. and we are touched by different methods.. If a church knows that JESUS is the Only way to be saved, then I know they are on the right track.. As for Hagee I watch him a lot. I have never heard him say that Jews don't have to be saved. You have to have knowledge of the Bible to make sure you know what is true and what is not.. Have you noticed if you google Graham or Hagee.. the sites are mostly things against them.. I bought Graham's remake of The Coming Storm and in it he states that the only way to be saved was through the name of Jesus.. I pray that God will give me the strength to stand strong.. when what I can see is happening in America starts to happen..
Just to clarify. Ecumenism is a baby of the Vatican re VATICAN II. It is not specifically one church for everybody. Maybe that is a dictionary definition but that doesn't say everything. Ecumenism basically means, uniting your protestant church or organisation with the Catholics and/or becoming co-workers with Rome to bring about a one global Catholic church ie claiming back the "separated brethren" from the protestant churches. If you check out other Vatican links on the subject you will see clear evidence that ecumenism originated from the Vatican in the 1960's. If you would like me to show other links, I will dig them out. So ecumenism (in its original sense) is all about uniting with the objectives of the Vatican to ultimately come under the authority of the Pope. Hope that helps. God bless you all in the U.S.A. I have said it before... The Lord has/is using you to uphold The Word in these last seconds of this dying age. I fully appreciate how troubled you all are at the decline (your words) of your country. We older Brits have seen the end of a once great Empire (man's perspective). While you are ahead of the world in certain ways; you are way behind the U.K. in the spiritual decline. We have been learning the hard way about the dangers of the Ecumenical manifestation, with Mary's stars from her 'crown' fluttering over our heads AND replacing our Union Jack on car number plates. The 'Roman Empire' is alive and well on our islands, and more so a few miles across the English Channel now land-linked with a 'Chunnel'. We are living what you are guessing about - to date. The lesson to 'come apart', and the necessity to 'be separated', has/is a very bitter pill that I, at least, tried to avoid swallowing. In the end it boiled down to being in God’s will by obeying His Word, or being ‘popular’. Obedience leads to isolation and a great deal of sorrow. We have been in the midst of galloping apostasy for several decades, and the PC Brigade has got us over a legal barrel – seriously! Y’all are only beginning to experience what we have been living for several years, but the best news is that it means Jesus is near! I hope you understand what I mean when I say that it is very difficult to put an ‘old head on young shoulders’? That’s how it feels to me, we would like to give you the benefit of our experience and testimony, but understandably, it isn't really wanted or needed - is it! You are blessed with many ‘Watchman’ sites e.g. Jan Markell’s Olive Tree Ministries. Jesus and the Disciples ‘named names’ to challenge false teaching. This is often deemed as ‘un-loving’; yet what is the most loving, giving an unwanted warning of danger or keeping quiet and let folk find out the hard way? I once started a list of Scriptures of naming names and warning of error, the more I looked, the more I found. Billy was quite right to speak up about the ‘false gospel’ being trafficked to Jews, no time for niceties there especially when another believer has asked for guidance. DrNofog was outspoken, but he was being truthful, no one has the right to barge into another’s ‘home’ disregarding their hospitality. You aren’t yet perfect, and neither are we – so what else is new? I have stopped looking for everything to be ‘just so’, it doesn’t exist – yet, and apparently one man’s meat is another man’s poison. So when push comes to shove GRACE is the answer with big helpings of respect and common courtesy – like ‘thank you ALL for giving me so much of your time, patience and prayer support. Warts and all ;-) you have made a difference in my life. By the way I have sent you another email. Ezekiel was called as a Watchman for the house of Israel. God instructed him of his duty as a watchman. He wasn't told to pursue converting or changing the people but to simply warn them (whether solicited or unsolicited)of the danger and what they should do. Once he had warned them his job was complete and their blood would no longer be on him. It is not easy being a watchman because they tend to get insulted, criticised and rejected from even those of their own brethren. God has called me to be a watchman and speak out the warnings. I do not intend or mean to say more than is necessary. If I do say more than I should, I am sorry, but I try to give the warning and then leave it with the readers to decide. At least I have discharged my responsibility. Most of what I wrote was in reply to JMB to answer his questions, trying to help. However, I am still confused. If this site understands the evils of the RC and ecumenism, why are ecumenical leaders being extolled, here? Fullers Theological College (one of the Board Trustees), Promise Keeper Speaker (taped messages at events), Lausanne Movement (Founder), endorses the New Age "Message" paraphrase, Missions America Coalition (member of) to name a few. Okay, will say no more. As I said, I am just trying to help by alerting you to things which you may not be aware of. Now I have said it, I will shut up. As I said above Nathan, I am here on this site because one of your respected contributors invited me . Therefore I had the impression (mistakingly) that we were on the same page. Sorry if I misunderstood. As sue said, I DO mean well. John,, thanks for trying to help me.. As I said, I know whatever you say is meant in a loving way. I am a Baptist, and I believe the Bible is the same today as it was yesterday.. no changing just because you like someone who is doing wrong... as for Catholic's.. they allow gay priest,, and molesting innocent Children.. but I know for a fact that some don't agree. I never judge all by the religion they have, but by the way they follow Gods word.. I have been a Baptist for all my life and don't intend to change the bible when I am so close to Paradise.. But the rest of the dead lived not again until the thousand years were finished. This [is] the first resurrection. Rev 20 verse 5. I guess that is stating there are 2 resurrections... because the next verse states Blessed and holy [is] he that hath part in the first resurrection: on such the second death hath no power,. Alright. another question.. I know that when all nations come to destroy Israel,, God defeats them.. I feel that is before the Devil is thrown into the pit..with chains.. So isn't there another time they all come against Jesus and the Saints when the devil is turned loose..
John, your comments and long experience as a pastor are most welcome. JMB, at the end of the Millennial reign Satan will be released from the Pit and allowed to gather those who wish to rebel against Jesus. It's called Gog & Magog (Rev. 20), a harkening back to the Gog-Magog Battle of Ezek. 38-39. They will come against Christ at Jerusalem, but with just a word Jesus will defeat them and begin the Great White Throne Judgment. You can find more info on these and other wars of the end times in this article by Dr. Reagan. So when is the battle when God defeats them and then Israel knows God is with them again? I am watching what is happening in Israel and how they are all hating Israel... even the DICTATORS here in America are against them.. Seems they battle to rid the world of Israel is on the verge of happening...I hate to see Israel hurt anymore.. When I read in the Bible the verse that states come out of her... I used to wonder what it mean... but I read an article that stated the Catholic church was what God was referring to.. Do you feel that way? I feel now that the world wide religion might be Muslin.. seems all leaders including our own want that.. Thanks JMB. You are very welcome. Thanks also for being understanding. For your eyes only, the Catholic institution is not a Christian denomination. It has a very long history starting shortly after the global Noah's flood in Genesis. Satan managed to deceive a large number of people of setting up an empire in opposition to God. It became known as Babylon and had its own satanic religion, which included mysteries, codes etc. This religion and its influence spread throughout the world and various offshoots of this religion showed up in many cultures. Although many different names were used for their gods and goddesses it was basically all the same religion. Much later (once Christianity had started) this Babylonic religion infiltrated the Christian church and culminated in the Catholic church, which was actually Babylon religion but using "christian" names. The true church was persecuted by this Babylonic/Christian religion and had to go underground. During the reformation, protestantism arose because true believers protested at the "works" of the Catholic church and the "buying of indulgencies" etc. The Bible became available to everyman around this time. That is why they realised that the Catholic institution was WAY OFF true Christianity. To be ecumenical means to allow the infiltration of this Babylonic religion into our churches. By the way, you are spot on when you say the message of the Bible NEVER changes. This is why we can trust the Bible more than mere man who often misrepresents the teachings or deliberately mishandles it for ulterior reasons. ie compare the whole bible, getting everything in context and not teach from isolated verses of scripture but study properly in context. I hope you find that information useful brother. Oh John,, I am a sister.ha ha.. and yes all info is useful..
Israel is going to go through even more terrible times ahead. It has been prophesied in the Bible. However, God WILL step in and save them. Besides, The Bible prophesys state that this generation of Israel is here forever. Although the whole world will come against Israel and many Jewish people will be killed - two thirds, one third will be saved by God when they FINALLY say "blessed is He (Jesus) who comes in the Name of the Lord". Zechariah said that they will look upon Jesus, whom they pierced and mourn for HIM. There WILL be a nation wide revival in that Land at that time. So Yes Israel is still to suffer much but PRAISE GOD He will step in and change all that. We believe that will happen after ALL born again believers (still on Earth at THAT time) have been raptured. The Book of Revelation tells us what the global religion will look like. It doesn't seem to describe Islam, but DOES describe a religious system which seems to be controlled from Rome. Many believe that the Pope will be a figure head of a united faiths - maybe with the New Age coating and will include Islam IF Islam survives the Gog and Magog wars prophesied in Ezekiel 38-39. Many believe that the Gog and Magog wars are the next largest prophetic event to come on the calendar. Notice that many Islamic nations are included in that war. I always say.. Israel will be the last one standing.. and I firmly believe that.. Thanks for all info... will visit again soon.. Oh have you ever read rapture ready site. they are very informative.. sometimes I agree and sometimes not.. but the most important thing is like I said... Knowing that Jesus is the only way to salvation.. Have a blessed day..
oops! For some reason JMB sounded masculine - don't know why. Let me just take the foot from my mouth, so that I can drink my tea. What you are observing IS Ecumenism; the combining of ALL faiths in unity for the One church of the coming False Prophet – who will direct worship to the A/c. Their gatherings are led by the Pope and all mainline Protestant Denominations are represented including Baptist, Methodist, Anglican, Elim, AoG,Evangelical Alliance, The Salvation Army… but to the best of my knowledge the ‘Brethren Assemblies’ do not participate. Members include Muslims, Hindu’s, Sikhs, Buddhist, Witch Doctors, Spiritualists… every religion is joined as one and ALL religions are respected as ‘A’ way to the same God. They call it ‘The Brotherhood of Man’ – yet if God is not our God, then we are of our father, the devil. John8:44. 2 Cor.6:14 Do not be unequally yoked together with unbelievers. For what fellowship has righteousness with lawlessness? And what communion has light with darkness? 16. And what agreement has the temple of God with idols? For you are the temple of the living God. As God has said: "I will dwell in them And walk among [them]. I will be their God, And they shall be My people. Just wondering how you got that information regarding the specific churches included in your list and why the Brethren assembly would not be represented. Is it in relation to who has joined the World Council of Churches? Easy John, its all been documented on T.V. - and I am old enough to remember it beginning! The Francis of Assis church in Italy was an important venue. After it was over, the church was mercifully empty when an earthquak struck and felled the steeple badly damaging the place! It was all filmed with Red Indians in full tribal gear joining in the prayers. They had the Koran and other religious books on the altar alongside the Bible. Mustn't forget that there was a Rabbi there as well. Its bound to be somewhere on Google. Just had a quick google search, looking at several sites. I cannot find a list of all the Christian groups who attended the Assissi 1986 meeting, so still don't know re the Brethren assembly. Anyway, the Pope has called to celebrate the 25th anniversary of that famous gathering by reconstructing it again this year in October. Certainly there should be room for disagreement on a blog--no point of conflict there. But there's a world of difference between someone disagreeing with you, Nathan, or me on this blog. You and I can defend our points or explain ourselves. However, when people start bashing other teachers/believers who AREN'T regular attenders here, then, they're stepping over the line. Many Christian sites refuse to print the names of other teachers/preachers in negative posts or to say anything bad about them. And personally, I think that's a stellar idea. At any rate, I've asked nicely that you put a stop to this. If you choose to let it go on, then my only remaining choice is to bow out. "When Peter came to Antioch, I opposed him to his face, because he was clearly in the wrong. Before certain men came from James, he used to eat with the Gentiles. But when they arrived, he began to draw back and separate himself from the Gentiles because he was afraid of those who belonged to the circumcision group. The other Jews joined him in his hypocrisy, so that by their hypocrisy even Barnabas was led astray." Paul is writing to the Galatian church without Peter being present to defend himself. If Peter (a spiritual giant in the church)could be criticised for a relatively small misdemeanor. Is there anything in the Bible (in correct context)that forbids us from doing this? If not, why would it be wrong to expose the names of those who are promoting apostasy? The purpose of doing so is always to protect the innocent from being deceived by such people. Laura, I have just started reading the blog.. and as far as I am concerned... everyone on this is being as honest as they can be..and just stating what they believe. |Laura, don't get upset when someone you know is honestly trying to help..and from reading your statements, you have been on this blog for a long time.. I remember years ago in Sunday School stating that the world would have to revolve a lot to become like the Bible states.. then not to long for that, politicians were WINNING due to their thoughts on Abortion.. also I said the USA would never give its power to another country.... now they have given it to a dictator.who is leading us over the cliff..Lets not argue.. just keep watching for Jesus and trying to stay strong in God..
whilst it may be true (I don't know because I have not seen the book) that Billy Graham says those things, his videos state something quite different. He qualified "Jesus is the only way" (from his own lips on video)by saying that the muslims, buddhists etc follow Jesus (or the Christ)in their own way within the revelation given to them. In other words, Billy is saying that EVERYONE who has some form of revelation of Jesus (or the Christ) within their religions (even if they have never become Christians or not heard of Jesus, will be saved because they are following Jesus within their hearts, whether they know it or not. This is similar to new age teachings and/or at the least very confused thinking. Although he says that Jesus is the only way to God, it seems he thinks Jesus appears in all other religions. That is the teaching of New age and ecumenism. You need to read between the lines of what Billy is actually writing in his latter books. He may say that Jesus is the only way, but he means something different to what we mean by that. Continue reading on to see how he qualifies what he says. By the way (bearing in mind his age) are we sure that no-one else edited out anything controversial he wrote? I say that because I have videos where he clearly states the above heresy. These videos have not been doctored and are clearly him speaking. We could put down the woolly, confused thinking, down to his age, but even when Billy was in his prime he stated (on one of the videos)that he believed on life on other planets and used Catholic priests, nuns in large numbers amongst his counsellors at his rallies throughout his lifetime ministry. The proof is in the evidence. Well whatever he is saying.. I know there is only one way to salvation... I used to watch Oprah... thought it was a good show.. then years ago she had a show on that was about religion.. she told the audience that no matter what they believed in.. buddah or whatever they would be alright... NEVER WATCHED her again.. and now I know that she is in league with the devil and is said that she has a cult with millions of people.. I know the Bible. and like I said before... I know what is right and what is wrong... Didn't hear that sermon from Graham.. but I am one who likes to weight everything and then make a decision... the Bible states there will come false prophets,, and they are everywhere.. the Southern Baptist are now trying to change the Bible too. But our church would never ever get a preacher that didn't teach the Bible.. In fact the one we have now wants to get out of the southern baptist.. but others don't... there are 2 sides to the story in my mind.. the preacher is right,, since there are false preachers in it.. but then on the other hand... if we let them take over.. then in the future all children will be mislead... we need to stay there and try to keep the record straight.. And the way I see it.. the media won't cover our little country church.. but it will cover the Southern Baptist. I am a child of God's and the false preachers can't fool me..When I first heard our Prs was running for office. A chill went down my back. I think it was God telling me something.. and seeing all that is happening.. I know he was.. Thanks for all the help, but in reality.. I do know what is right and what is wrong.. I am still debating in my mind the pre rapture... Guess reading everything I can.. I got too much info.. I am just praying to God if I do go through the tribulations.. that I have the courage to stand up to this one religion thing.. even upon facing Death..
That should be the approach of all believers. The purpose of my blog is NOT to put people down but to illustrate the importance (these days) of being watchful, discerning and wise in light of the deceptions that surround us and to be aware of where the deceptions lie. By being Bereans - checking the scriptures daily, we can be far more equipped to deal with these things in these dark last days. By the way, we must also be careful how we read/study the Bible. We MUST always be prepared to be changed by the Bible, accepting what it says with a sincere heart and NOT change the Bible (ie make it say what we want it to say, distorting its meanings). I just listened to a Billy Graham video taken in the early 1950's (I think). Wow, he was much more powerful then and was clearly scriptural at that time. Within his message he told us that in latter times great preachers/teachers will fall from the faith and change their message after becoming seduced by evil spirits. That breaks my heart to think that he was referring to himself without realising it. It is hard to understand how a man who preached the Bible so powerfully could do so if they were not truly born-again. We must pray for Billy. Could it be that the best way to deceive the saints is to preach the truth with great fervour (at the beginning) and then very gradually (hardly noticeable)change the message by watering it down over the decades. Is it possible that this could have been the plan? It is clear that he worked closely with the Vatican from the 1960's onward. Anyway, the point is that we should NEVER put our trust in man or waste our money buying books from false teachers and ecumenists or give donations to them as we would then be helping them to expand their false ministries. Re studying the Bible. Many interpret the Bible based on what makes sense to their finite minds. Often, public opinion on morals, right and wrong and the general thinking of todays society affects the way we interpret the Bible. Therefore, we can unwittingly water down the truth of the Bible because of the world's influence. I often remind myself to "do not be conformed to this world, but be transformed by the renewing of your mind" Rom 12:22 We must interpret the Bible with that in mind. mLet it say what it says without ignoring anything or making it fit what we think it should say. JMB, I am saying those things for the benefit of anybody reading this. I am not suggesting that you are not doing these things. Over the years many people have come to this site and have been critical of Dr. Reagan and Nathan and those posts have never been deleted to my knowledge. I don't recall you ever threatening to leave because of it. So if you were silent when our "home team" was being scrutinized, why are you making a big deal about it now that others are scrutinized? I doubt any of these comments are motivated by hostility. From what I've read they are expressions of genuine concern. Finally, IF you do choose to "leave" please know that it will be OUR loss. Though I don't often aree with you I read your viewpoint and respect your right to express it (even if I comment against it). Please stay! If not, please remember we'll always want you back!!! I don't do denominationism, but what I do know is this. God is speaking to his church and some are listening to him and others aren't. God is using his people, call them prophets and like of old the leadership are ignoring his warnings. God loves his people and he will not allow the old school leadership in all the church's whatever denomination they are to stop him reaching his kids. Keep your heads down for the storm is brewing and God is on the move, certain people are going to be unthrowned so that got God can unite and reach his family who need him more than anything now. We need God and he needs us.